Unknown: preg_replace(): The /e modifier is deprecated, use preg_replace_callback instead in /home/paris/domains/parisut.com/public_html/shoponline/vqmod/vqmod.php on line 329Unknown: preg_replace(): The /e modifier is deprecated, use preg_replace_callback instead in /home/paris/domains/parisut.com/public_html/shoponline/vqmod/vqmod.php on line 329Unknown: preg_replace(): The /e modifier is deprecated, use preg_replace_callback instead in /home/paris/domains/parisut.com/public_html/shoponline/vqmod/vqmod.php on line 329Unknown: preg_replace(): The /e modifier is deprecated, use preg_replace_callback instead in /home/paris/domains/parisut.com/public_html/shoponline/vqmod/vqmod.php on line 329Unknown: preg_replace(): The /e modifier is deprecated, use preg_replace_callback instead in /home/paris/domains/parisut.com/public_html/shoponline/vqmod/vqmod.php on line 329Unknown: preg_replace(): The /e modifier is deprecated, use preg_replace_callback instead in /home/paris/domains/parisut.com/public_html/shoponline/vqmod/vqmod.php on line 329Unknown: preg_replace(): The /e modifier is deprecated, use preg_replace_callback instead in /home/paris/domains/parisut.com/public_html/shoponline/vqmod/vqmod.php on line 329Unknown: preg_replace(): The /e modifier is deprecated, use preg_replace_callback instead in /home/paris/domains/parisut.com/public_html/shoponline/vqmod/vqmod.php on line 329Unknown: preg_replace(): The /e modifier is deprecated, use preg_replace_callback instead in /home/paris/domains/parisut.com/public_html/shoponline/vqmod/vqmod.php on line 329Unknown: preg_replace(): The /e modifier is deprecated, use preg_replace_callback instead in /home/paris/domains/parisut.com/public_html/shoponline/vqmod/vqmod.php on line 329Unknown: preg_replace(): The /e modifier is deprecated, use preg_replace_callback instead in /home/paris/domains/parisut.com/public_html/shoponline/vqmod/vqmod.php on line 329Unknown: preg_replace(): The /e modifier is deprecated, use preg_replace_callback instead in /home/paris/domains/parisut.com/public_html/shoponline/vqmod/vqmod.php on line 329Unknown: preg_replace(): The /e modifier is deprecated, use preg_replace_callback instead in /home/paris/domains/parisut.com/public_html/shoponline/vqmod/vqmod.php on line 329Unknown: preg_replace(): The /e modifier is deprecated, use preg_replace_callback instead in /home/paris/domains/parisut.com/public_html/shoponline/vqmod/vqmod.php on line 329Unknown: preg_replace(): The /e modifier is deprecated, use preg_replace_callback instead in /home/paris/domains/parisut.com/public_html/shoponline/vqmod/vqmod.php on line 329Unknown: preg_replace(): The /e modifier is deprecated, use preg_replace_callback instead in /home/paris/domains/parisut.com/public_html/shoponline/vqmod/vqmod.php on line 329Unknown: preg_replace(): The /e modifier is deprecated, use preg_replace_callback instead in /home/paris/domains/parisut.com/public_html/shoponline/vqmod/vqmod.php on line 329Unknown: preg_replace(): The /e modifier is deprecated, use preg_replace_callback instead in /home/paris/domains/parisut.com/public_html/shoponline/vqmod/vqmod.php on line 329Unknown: preg_replace(): The /e modifier is deprecated, use preg_replace_callback instead in /home/paris/domains/parisut.com/public_html/shoponline/vqmod/vqmod.php on line 329Unknown: preg_replace(): The /e modifier is deprecated, use preg_replace_callback instead in /home/paris/domains/parisut.com/public_html/shoponline/vqmod/vqmod.php on line 329Unknown: preg_replace(): The /e modifier is deprecated, use preg_replace_callback instead in /home/paris/domains/parisut.com/public_html/shoponline/vqmod/vqmod.php on line 329Unknown: preg_replace(): The /e modifier is deprecated, use preg_replace_callback instead in /home/paris/domains/parisut.com/public_html/shoponline/vqmod/vqmod.php on line 329Unknown: preg_replace(): The /e modifier is deprecated, use preg_replace_callback instead in /home/paris/domains/parisut.com/public_html/shoponline/vqmod/vqmod.php on line 329Unknown: preg_replace(): The /e modifier is deprecated, use preg_replace_callback instead in /home/paris/domains/parisut.com/public_html/shoponline/vqmod/vqmod.php on line 329Unknown: preg_replace(): The /e modifier is deprecated, use preg_replace_callback instead in /home/paris/domains/parisut.com/public_html/shoponline/vqmod/vqmod.php on line 329Unknown: preg_replace(): The /e modifier is deprecated, use preg_replace_callback instead in /home/paris/domains/parisut.com/public_html/shoponline/vqmod/vqmod.php on line 329Unknown: preg_replace(): The /e modifier is deprecated, use preg_replace_callback instead in /home/paris/domains/parisut.com/public_html/shoponline/vqmod/vqmod.php on line 329Unknown: preg_replace(): The /e modifier is deprecated, use preg_replace_callback instead in /home/paris/domains/parisut.com/public_html/shoponline/vqmod/vqmod.php on line 329Unknown: preg_replace(): The /e modifier is deprecated, use preg_replace_callback instead in /home/paris/domains/parisut.com/public_html/shoponline/vqmod/vqmod.php on line 329Unknown: preg_replace(): The /e modifier is deprecated, use preg_replace_callback instead in /home/paris/domains/parisut.com/public_html/shoponline/vqmod/vqmod.php on line 329Unknown: preg_replace(): The /e modifier is deprecated, use preg_replace_callback instead in /home/paris/domains/parisut.com/public_html/shoponline/vqmod/vqmod.php on line 329Unknown: preg_replace(): The /e modifier is deprecated, use preg_replace_callback instead in /home/paris/domains/parisut.com/public_html/shoponline/vqmod/vqmod.php on line 329Unknown: preg_replace(): The /e modifier is deprecated, use preg_replace_callback instead in /home/paris/domains/parisut.com/public_html/shoponline/vqmod/vqmod.php on line 329Unknown: preg_replace(): The /e modifier is deprecated, use preg_replace_callback instead in /home/paris/domains/parisut.com/public_html/shoponline/vqmod/vqmod.php on line 329Unknown: preg_replace(): The /e modifier is deprecated, use preg_replace_callback instead in /home/paris/domains/parisut.com/public_html/shoponline/vqmod/vqmod.php on line 329Unknown: preg_replace(): The /e modifier is deprecated, use preg_replace_callback instead in /home/paris/domains/parisut.com/public_html/shoponline/vqmod/vqmod.php on line 329Unknown: preg_replace(): The /e modifier is deprecated, use preg_replace_callback instead in /home/paris/domains/parisut.com/public_html/shoponline/vqmod/vqmod.php on line 329Unknown: preg_replace(): The /e modifier is deprecated, use preg_replace_callback instead in /home/paris/domains/parisut.com/public_html/shoponline/vqmod/vqmod.php on line 329Unknown: preg_replace(): The /e modifier is deprecated, use preg_replace_callback instead in /home/paris/domains/parisut.com/public_html/shoponline/vqmod/vqmod.php on line 329Unknown: preg_replace(): The /e modifier is deprecated, use preg_replace_callback instead in /home/paris/domains/parisut.com/public_html/shoponline/vqmod/vqmod.php on line 329Unknown: preg_replace(): The /e modifier is deprecated, use preg_replace_callback instead in /home/paris/domains/parisut.com/public_html/shoponline/vqmod/vqmod.php on line 329Unknown: preg_replace(): The /e modifier is deprecated, use preg_replace_callback instead in /home/paris/domains/parisut.com/public_html/shoponline/vqmod/vqmod.php on line 329Unknown: preg_replace(): The /e modifier is deprecated, use preg_replace_callback instead in /home/paris/domains/parisut.com/public_html/shoponline/vqmod/vqmod.php on line 329Unknown: preg_replace(): The /e modifier is deprecated, use preg_replace_callback instead in /home/paris/domains/parisut.com/public_html/shoponline/vqmod/vqmod.php on line 329Unknown: preg_replace(): The /e modifier is deprecated, use preg_replace_callback instead in /home/paris/domains/parisut.com/public_html/shoponline/vqmod/vqmod.php on line 329Unknown: preg_replace(): The /e modifier is deprecated, use preg_replace_callback instead in /home/paris/domains/parisut.com/public_html/shoponline/vqmod/vqmod.php on line 329Unknown: preg_replace(): The /e modifier is deprecated, use preg_replace_callback instead in /home/paris/domains/parisut.com/public_html/shoponline/vqmod/vqmod.php on line 329Unknown: preg_replace(): The /e modifier is deprecated, use preg_replace_callback instead in /home/paris/domains/parisut.com/public_html/shoponline/vqmod/vqmod.php on line 329Unknown: preg_replace(): The /e modifier is deprecated, use preg_replace_callback instead in /home/paris/domains/parisut.com/public_html/shoponline/vqmod/vqmod.php on line 329Unknown: preg_replace(): The /e modifier is deprecated, use preg_replace_callback instead in /home/paris/domains/parisut.com/public_html/shoponline/vqmod/vqmod.php on line 329Unknown: preg_replace(): The /e modifier is deprecated, use preg_replace_callback instead in /home/paris/domains/parisut.com/public_html/shoponline/vqmod/vqmod.php on line 329Unknown: preg_replace(): The /e modifier is deprecated, use preg_replace_callback instead in /home/paris/domains/parisut.com/public_html/shoponline/vqmod/vqmod.php on line 329Unknown: preg_replace(): The /e modifier is deprecated, use preg_replace_callback instead in /home/paris/domains/parisut.com/public_html/shoponline/vqmod/vqmod.php on line 329Unknown: preg_replace(): The /e modifier is deprecated, use preg_replace_callback instead in /home/paris/domains/parisut.com/public_html/shoponline/vqmod/vqmod.php on line 329Unknown: preg_replace(): The /e modifier is deprecated, use preg_replace_callback instead in /home/paris/domains/parisut.com/public_html/shoponline/vqmod/vqmod.php on line 329Unknown: preg_replace(): The /e modifier is deprecated, use preg_replace_callback instead in /home/paris/domains/parisut.com/public_html/shoponline/vqmod/vqmod.php on line 329Unknown: preg_replace(): The /e modifier is deprecated, use preg_replace_callback instead in /home/paris/domains/parisut.com/public_html/shoponline/vqmod/vqmod.php on line 329Unknown: preg_replace(): The /e modifier is deprecated, use preg_replace_callback instead in /home/paris/domains/parisut.com/public_html/shoponline/vqmod/vqmod.php on line 329Unknown: preg_replace(): The /e modifier is deprecated, use preg_replace_callback instead in /home/paris/domains/parisut.com/public_html/shoponline/vqmod/vqmod.php on line 329Unknown: preg_replace(): The /e modifier is deprecated, use preg_replace_callback instead in /home/paris/domains/parisut.com/public_html/shoponline/vqmod/vqmod.php on line 329Unknown: preg_replace(): The /e modifier is deprecated, use preg_replace_callback instead in /home/paris/domains/parisut.com/public_html/shoponline/vqmod/vqmod.php on line 329Unknown: preg_replace(): The /e modifier is deprecated, use preg_replace_callback instead in /home/paris/domains/parisut.com/public_html/shoponline/vqmod/vqmod.php on line 329Unknown: preg_replace(): The /e modifier is deprecated, use preg_replace_callback instead in /home/paris/domains/parisut.com/public_html/shoponline/vqmod/vqmod.php on line 329Unknown: preg_replace(): The /e modifier is deprecated, use preg_replace_callback instead in /home/paris/domains/parisut.com/public_html/shoponline/vqmod/vqmod.php on line 329Unknown: preg_replace(): The /e modifier is deprecated, use preg_replace_callback instead in /home/paris/domains/parisut.com/public_html/shoponline/vqmod/vqmod.php on line 329Unknown: preg_replace(): The /e modifier is deprecated, use preg_replace_callback instead in /home/paris/domains/parisut.com/public_html/shoponline/vqmod/vqmod.php on line 329Unknown: preg_replace(): The /e modifier is deprecated, use preg_replace_callback instead in /home/paris/domains/parisut.com/public_html/shoponline/vqmod/vqmod.php on line 329Unknown: preg_replace(): The /e modifier is deprecated, use preg_replace_callback instead in /home/paris/domains/parisut.com/public_html/shoponline/vqmod/vqmod.php on line 329Unknown: preg_replace(): The /e modifier is deprecated, use preg_replace_callback instead in /home/paris/domains/parisut.com/public_html/shoponline/vqmod/vqmod.php on line 329Unknown: preg_replace(): The /e modifier is deprecated, use preg_replace_callback instead in /home/paris/domains/parisut.com/public_html/shoponline/vqmod/vqmod.php on line 329Unknown: preg_replace(): The /e modifier is deprecated, use preg_replace_callback instead in /home/paris/domains/parisut.com/public_html/shoponline/vqmod/vqmod.php on line 329Unknown: preg_replace(): The /e modifier is deprecated, use preg_replace_callback instead in /home/paris/domains/parisut.com/public_html/shoponline/vqmod/vqmod.php on line 329Unknown: preg_replace(): The /e modifier is deprecated, use preg_replace_callback instead in /home/paris/domains/parisut.com/public_html/shoponline/vqmod/vqmod.php on line 329Unknown: preg_replace(): The /e modifier is deprecated, use preg_replace_callback instead in /home/paris/domains/parisut.com/public_html/shoponline/vqmod/vqmod.php on line 329Unknown: preg_replace(): The /e modifier is deprecated, use preg_replace_callback instead in /home/paris/domains/parisut.com/public_html/shoponline/vqmod/vqmod.php on line 329Unknown: preg_replace(): The /e modifier is deprecated, use preg_replace_callback instead in /home/paris/domains/parisut.com/public_html/shoponline/vqmod/vqmod.php on line 329Unknown: preg_replace(): The /e modifier is deprecated, use preg_replace_callback instead in /home/paris/domains/parisut.com/public_html/shoponline/vqmod/vqmod.php on line 329Unknown: preg_replace(): The /e modifier is deprecated, use preg_replace_callback instead in /home/paris/domains/parisut.com/public_html/shoponline/vqmod/vqmod.php on line 329Unknown: preg_replace(): The /e modifier is deprecated, use preg_replace_callback instead in /home/paris/domains/parisut.com/public_html/shoponline/vqmod/vqmod.php on line 329Unknown: preg_replace(): The /e modifier is deprecated, use preg_replace_callback instead in /home/paris/domains/parisut.com/public_html/shoponline/vqmod/vqmod.php on line 329Unknown: preg_replace(): The /e modifier is deprecated, use preg_replace_callback instead in /home/paris/domains/parisut.com/public_html/shoponline/vqmod/vqmod.php on line 329Unknown: preg_replace(): The /e modifier is deprecated, use preg_replace_callback instead in /home/paris/domains/parisut.com/public_html/shoponline/vqmod/vqmod.php on line 329Unknown: preg_replace(): The /e modifier is deprecated, use preg_replace_callback instead in /home/paris/domains/parisut.com/public_html/shoponline/vqmod/vqmod.php on line 329Unknown: preg_replace(): The /e modifier is deprecated, use preg_replace_callback instead in /home/paris/domains/parisut.com/public_html/shoponline/vqmod/vqmod.php on line 329Unknown: preg_replace(): The /e modifier is deprecated, use preg_replace_callback instead in /home/paris/domains/parisut.com/public_html/shoponline/vqmod/vqmod.php on line 329Unknown: preg_replace(): The /e modifier is deprecated, use preg_replace_callback instead in /home/paris/domains/parisut.com/public_html/shoponline/vqmod/vqmod.php on line 329Unknown: preg_replace(): The /e modifier is deprecated, use preg_replace_callback instead in /home/paris/domains/parisut.com/public_html/shoponline/vqmod/vqmod.php on line 329Unknown: preg_replace(): The /e modifier is deprecated, use preg_replace_callback instead in /home/paris/domains/parisut.com/public_html/shoponline/vqmod/vqmod.php on line 329Unknown: preg_replace(): The /e modifier is deprecated, use preg_replace_callback instead in /home/paris/domains/parisut.com/public_html/shoponline/vqmod/vqmod.php on line 329Unknown: preg_replace(): The /e modifier is deprecated, use preg_replace_callback instead in /home/paris/domains/parisut.com/public_html/shoponline/vqmod/vqmod.php on line 329Unknown: preg_replace(): The /e modifier is deprecated, use preg_replace_callback instead in /home/paris/domains/parisut.com/public_html/shoponline/vqmod/vqmod.php on line 329Unknown: preg_replace(): The /e modifier is deprecated, use preg_replace_callback instead in /home/paris/domains/parisut.com/public_html/shoponline/vqmod/vqmod.php on line 329Unknown: preg_replace(): The /e modifier is deprecated, use preg_replace_callback instead in /home/paris/domains/parisut.com/public_html/shoponline/vqmod/vqmod.php on line 329Unknown: preg_replace(): The /e modifier is deprecated, use preg_replace_callback instead in /home/paris/domains/parisut.com/public_html/shoponline/vqmod/vqmod.php on line 329Unknown: preg_replace(): The /e modifier is deprecated, use preg_replace_callback instead in /home/paris/domains/parisut.com/public_html/shoponline/vqmod/vqmod.php on line 329Unknown: preg_replace(): The /e modifier is deprecated, use preg_replace_callback instead in /home/paris/domains/parisut.com/public_html/shoponline/vqmod/vqmod.php on line 329Unknown: preg_replace(): The /e modifier is deprecated, use preg_replace_callback instead in /home/paris/domains/parisut.com/public_html/shoponline/vqmod/vqmod.php on line 329Unknown: preg_replace(): The /e modifier is deprecated, use preg_replace_callback instead in /home/paris/domains/parisut.com/public_html/shoponline/vqmod/vqmod.php on line 329Unknown: preg_replace(): The /e modifier is deprecated, use preg_replace_callback instead in /home/paris/domains/parisut.com/public_html/shoponline/vqmod/vqmod.php on line 329Unknown: preg_replace(): The /e modifier is deprecated, use preg_replace_callback instead in /home/paris/domains/parisut.com/public_html/shoponline/vqmod/vqmod.php on line 329Unknown: preg_replace(): The /e modifier is deprecated, use preg_replace_callback instead in /home/paris/domains/parisut.com/public_html/shoponline/vqmod/vqmod.php on line 329Unknown: preg_replace(): The /e modifier is deprecated, use preg_replace_callback instead in /home/paris/domains/parisut.com/public_html/shoponline/vqmod/vqmod.php on line 329Unknown: preg_replace(): The /e modifier is deprecated, use preg_replace_callback instead in /home/paris/domains/parisut.com/public_html/shoponline/vqmod/vqmod.php on line 329Unknown: preg_replace(): The /e modifier is deprecated, use preg_replace_callback instead in /home/paris/domains/parisut.com/public_html/shoponline/vqmod/vqmod.php on line 329Unknown: preg_replace(): The /e modifier is deprecated, use preg_replace_callback instead in /home/paris/domains/parisut.com/public_html/shoponline/vqmod/vqmod.php on line 329Unknown: preg_replace(): The /e modifier is deprecated, use preg_replace_callback instead in /home/paris/domains/parisut.com/public_html/shoponline/vqmod/vqmod.php on line 329Unknown: preg_replace(): The /e modifier is deprecated, use preg_replace_callback instead in /home/paris/domains/parisut.com/public_html/shoponline/vqmod/vqmod.php on line 329Unknown: preg_replace(): The /e modifier is deprecated, use preg_replace_callback instead in /home/paris/domains/parisut.com/public_html/shoponline/vqmod/vqmod.php on line 329Unknown: preg_replace(): The /e modifier is deprecated, use preg_replace_callback instead in /home/paris/domains/parisut.com/public_html/shoponline/vqmod/vqmod.php on line 329Unknown: preg_replace(): The /e modifier is deprecated, use preg_replace_callback instead in /home/paris/domains/parisut.com/public_html/shoponline/vqmod/vqmod.php on line 329Unknown: preg_replace(): The /e modifier is deprecated, use preg_replace_callback instead in /home/paris/domains/parisut.com/public_html/shoponline/vqmod/vqmod.php on line 329Unknown: preg_replace(): The /e modifier is deprecated, use preg_replace_callback instead in /home/paris/domains/parisut.com/public_html/shoponline/vqmod/vqmod.php on line 329Unknown: preg_replace(): The /e modifier is deprecated, use preg_replace_callback instead in /home/paris/domains/parisut.com/public_html/shoponline/vqmod/vqmod.php on line 329Unknown: preg_replace(): The /e modifier is deprecated, use preg_replace_callback instead in /home/paris/domains/parisut.com/public_html/shoponline/vqmod/vqmod.php on line 329Unknown: preg_replace(): The /e modifier is deprecated, use preg_replace_callback instead in /home/paris/domains/parisut.com/public_html/shoponline/vqmod/vqmod.php on line 329Unknown: preg_replace(): The /e modifier is deprecated, use preg_replace_callback instead in /home/paris/domains/parisut.com/public_html/shoponline/vqmod/vqmod.php on line 329Unknown: preg_replace(): The /e modifier is deprecated, use preg_replace_callback instead in /home/paris/domains/parisut.com/public_html/shoponline/vqmod/vqmod.php on line 329Unknown: preg_replace(): The /e modifier is deprecated, use preg_replace_callback instead in /home/paris/domains/parisut.com/public_html/shoponline/vqmod/vqmod.php on line 329Unknown: preg_replace(): The /e modifier is deprecated, use preg_replace_callback instead in /home/paris/domains/parisut.com/public_html/shoponline/vqmod/vqmod.php on line 329Unknown: preg_replace(): The /e modifier is deprecated, use preg_replace_callback instead in /home/paris/domains/parisut.com/public_html/shoponline/vqmod/vqmod.php on line 329Unknown: preg_replace(): The /e modifier is deprecated, use preg_replace_callback instead in /home/paris/domains/parisut.com/public_html/shoponline/vqmod/vqmod.php on line 329Unknown: preg_replace(): The /e modifier is deprecated, use preg_replace_callback instead in /home/paris/domains/parisut.com/public_html/shoponline/vqmod/vqmod.php on line 329Unknown: preg_replace(): The /e modifier is deprecated, use preg_replace_callback instead in /home/paris/domains/parisut.com/public_html/shoponline/vqmod/vqmod.php on line 329Unknown: preg_replace(): The /e modifier is deprecated, use preg_replace_callback instead in /home/paris/domains/parisut.com/public_html/shoponline/vqmod/vqmod.php on line 329Unknown: preg_replace(): The /e modifier is deprecated, use preg_replace_callback instead in /home/paris/domains/parisut.com/public_html/shoponline/vqmod/vqmod.php on line 329Unknown: preg_replace(): The /e modifier is deprecated, use preg_replace_callback instead in /home/paris/domains/parisut.com/public_html/shoponline/vqmod/vqmod.php on line 329Unknown: preg_replace(): The /e modifier is deprecated, use preg_replace_callback instead in /home/paris/domains/parisut.com/public_html/shoponline/vqmod/vqmod.php on line 329Unknown: preg_replace(): The /e modifier is deprecated, use preg_replace_callback instead in /home/paris/domains/parisut.com/public_html/shoponline/vqmod/vqmod.php on line 329Unknown: preg_replace(): The /e modifier is deprecated, use preg_replace_callback instead in /home/paris/domains/parisut.com/public_html/shoponline/vqmod/vqmod.php on line 329Unknown: preg_replace(): The /e modifier is deprecated, use preg_replace_callback instead in /home/paris/domains/parisut.com/public_html/shoponline/vqmod/vqmod.php on line 329Unknown: preg_replace(): The /e modifier is deprecated, use preg_replace_callback instead in /home/paris/domains/parisut.com/public_html/shoponline/vqmod/vqmod.php on line 329Unknown: preg_replace(): The /e modifier is deprecated, use preg_replace_callback instead in /home/paris/domains/parisut.com/public_html/shoponline/vqmod/vqmod.php on line 329Unknown: preg_replace(): The /e modifier is deprecated, use preg_replace_callback instead in /home/paris/domains/parisut.com/public_html/shoponline/vqmod/vqmod.php on line 329Unknown: preg_replace(): The /e modifier is deprecated, use preg_replace_callback instead in /home/paris/domains/parisut.com/public_html/shoponline/vqmod/vqmod.php on line 329Unknown: preg_replace(): The /e modifier is deprecated, use preg_replace_callback instead in /home/paris/domains/parisut.com/public_html/shoponline/vqmod/vqmod.php on line 329Unknown: preg_replace(): The /e modifier is deprecated, use preg_replace_callback instead in /home/paris/domains/parisut.com/public_html/shoponline/vqmod/vqmod.php on line 329Unknown: preg_replace(): The /e modifier is deprecated, use preg_replace_callback instead in /home/paris/domains/parisut.com/public_html/shoponline/vqmod/vqmod.php on line 329Unknown: preg_replace(): The /e modifier is deprecated, use preg_replace_callback instead in /home/paris/domains/parisut.com/public_html/shoponline/vqmod/vqmod.php on line 329Unknown: preg_replace(): The /e modifier is deprecated, use preg_replace_callback instead in /home/paris/domains/parisut.com/public_html/shoponline/vqmod/vqmod.php on line 329Unknown: preg_replace(): The /e modifier is deprecated, use preg_replace_callback instead in /home/paris/domains/parisut.com/public_html/shoponline/vqmod/vqmod.php on line 329Unknown: preg_replace(): The /e modifier is deprecated, use preg_replace_callback instead in /home/paris/domains/parisut.com/public_html/shoponline/vqmod/vqmod.php on line 329Unknown: preg_replace(): The /e modifier is deprecated, use preg_replace_callback instead in /home/paris/domains/parisut.com/public_html/shoponline/vqmod/vqmod.php on line 329Unknown: preg_replace(): The /e modifier is deprecated, use preg_replace_callback instead in /home/paris/domains/parisut.com/public_html/shoponline/vqmod/vqmod.php on line 329Unknown: preg_replace(): The /e modifier is deprecated, use preg_replace_callback instead in /home/paris/domains/parisut.com/public_html/shoponline/vqmod/vqmod.php on line 329Unknown: preg_replace(): The /e modifier is deprecated, use preg_replace_callback instead in /home/paris/domains/parisut.com/public_html/shoponline/vqmod/vqmod.php on line 329Unknown: preg_replace(): The /e modifier is deprecated, use preg_replace_callback instead in /home/paris/domains/parisut.com/public_html/shoponline/vqmod/vqmod.php on line 329Unknown: preg_replace(): The /e modifier is deprecated, use preg_replace_callback instead in /home/paris/domains/parisut.com/public_html/shoponline/vqmod/vqmod.php on line 329Unknown: preg_replace(): The /e modifier is deprecated, use preg_replace_callback instead in /home/paris/domains/parisut.com/public_html/shoponline/vqmod/vqmod.php on line 329Unknown: preg_replace(): The /e modifier is deprecated, use preg_replace_callback instead in /home/paris/domains/parisut.com/public_html/shoponline/vqmod/vqmod.php on line 329Unknown: preg_replace(): The /e modifier is deprecated, use preg_replace_callback instead in /home/paris/domains/parisut.com/public_html/shoponline/vqmod/vqmod.php on line 329 Anti-Varicose cream by Parisut 100 g.
Home » Anti-Varicose cream by Parisut 100 g.
“Parisut” Anti-varicose cream in the set of beautaroma is mixing with high grade and naturally raw materials suit for all skin. It is a special formula of organic essential oil such as mint oil, geranium oil and lemongrass oil and organic cold pressed virgin coconut oil with herbal oil soluble extract such as Asiantica pennywort Oil extract, Sweet Basil oil extract, Plai oil Extract. 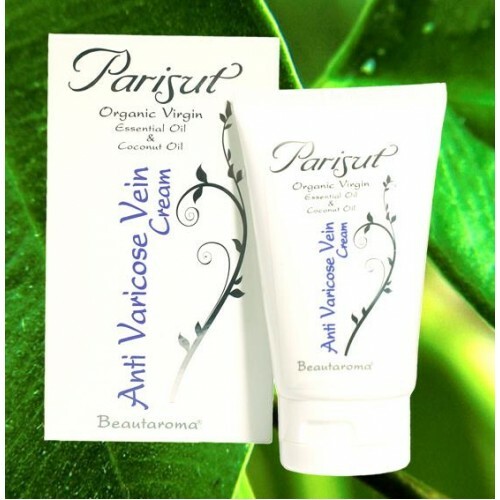 This special combination promotes anti splasmodic and blood flow, blood circulation and anti varicose vein. Please see pictures before and after attached.